Home ishqbaaz-latest-news-updates Ishqbaaz Latest News Update 22nd October 2018 Written Update"Shivaay Gets Scared at Office Run away from Office"
Ishqbaaz Latest News Update 22nd October 2018 Written Update"Shivaay Gets Scared at Office Run away from Office"
Ishqbaaz Latest News Update 22nd October 2018 Written Update"Shivaay Gets Scared at Office Run away from Office". Bhavya and Gauri see the print of Shivaay's hands over Annika's neck. Hiding it Annika tells them that it happened by mistake. He was subconsciousness and then... Bhavya says it's ok. It happens. People acquire PTSD after coming from prison maybe Shivaay is also suffering from the same. Gauri asks PTSD mean? Bhavya replies PTSD means Post Traumatic Stress Disorder. Such a condition is triggered after any scary or traumatic condition. Patients of PTSD see nightmare and flashbacks of what happened to them. Because of which they have panic attacks. Such patients prefer to stay alone. They can't do anything properly or sleep properly. In fact their desire to live ends. Sometimes this disorder becomes so serious that their behavior turns risky. Annika gets worried to listen about the depth of the problem. Gauri asks does this become dangerous for the one nearby. Bhavya replies yes but the sufferer it at the greatest risk. Shivaay is fighting against the world and himself too. We can't even imagine what he's tolerating. Annika asks how I can get Shivaay out from all this? Bhavya replies this is his fight and he has to fight himself. You can only support him. You have to reproduce the desire of living in him. Bring him back to his routine. They listen to the voice of Omru calling Bhavya and Gauri. Bhavya and Gauri have to leave. Bhavya gives Rudra's file to him. Om and Rudra are about to leave for their office. Gauri comes there and says one minute Omkara. You're forgetting something? And she puts Om's spectacles over his eyes. They leave for office. Searching for Shivaay Annika reaches their room. There she sees distraught Shivaay sitting alone in the darkness. She switches on the lights, removes the curtains and asks why are you sitting alone in this darkness? Light seems so good. But the sudden light pricks Shivaay's eyes. He rubs his eyes. Annika sits by him and says too much leave. Are you going office or not? Shivaay says Annika I can't go office. Annika asks you can't or you don't want? Shivaay says you saw what happened yesterday. Am a murderer for the people. Annika replies then you must go office. To tell them that you are Shivaay Singh Oberoi. The biggest businessman in this world. Now leave excuses. You are going office. Annika brings a shirt and says and you'll wear this. 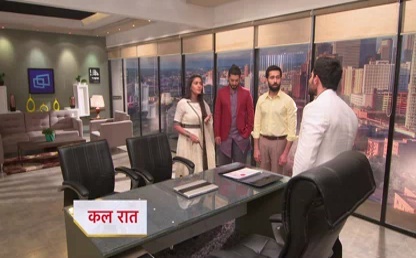 Shivaay again tries to deny Annika but Annika compels him to go to the office. Khanna gets surprised to see Shivaay ready for office. He himself takes him to the office. Finally, Shivaay reaches Oberoi industries. Just as he enters the office everyone gets astonished. They start gossiping about him. But Shivaay has no confidence left to order them. They take out their phones and start clicking his pictures. The hostile environment disappoints Shivaay. Khanna tries to distract the crowd. Upset Shivaay leaves the office.